I hope you’re sitting down, because Fuji Heavy is going to blow your mind with some of the upgrades to the 2017 Subaru BRZ. There will be a Track Mode, a Performance Package, and five more horsepower! Hey Hellcat—you’re on notice. 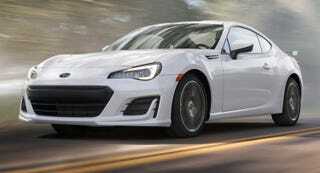 The Subaru BRZ is already one of the most well-balanced cars at its price point. People that bought one have been pretty impressed with the handling, though more than a few people think it could use some extra passing power. They’re about to get it—hard. Subaru listened and cranked up the 2.0-liter flat-four by an additional tire stomping five horsepower and an additional five lb-ft of torque. Think you can handle that? Think you’re ready? You’re not ready. I can tell you that right now. You might be wondering what kind of witchcraft Subaru had to manage to get such a massive jump in power. It turns out the motor gets new valves, camshaft and cylinder heads, a new aluminum intake manifold, and a redesigned exhaust manifold. I don’t know about you, but all that extra juice might be a danger to those manifolds. Alas, you only get the extra ponies if you buy a manual transmission. Automatic models are stuck with only 200 HP and 151 lb-ft.
Subaru also upgraded the chassis and suspension tuning by giving the 2017 BRZ updated coil springs and dampers, as well as a larger rear stabilizer bar. The strut tower braces were also modified in addition to the transmission cross-member plate and the rear wheel housings in order to increase the car’s rigidity. All of these adjustments elevate what was the “Sport Mode” into the “Track Mode.” Those that opt for the Limited trim and manual transmission can also add a “performance package” that comes with Brembo brakes, SACHS Performance shock absorbers and unique 17 inch black aluminum wheels. No word on pricing yet, but one thing’s for sure—the game has just changed forever. Ford, Dodge, Chevrolet and anyone else: just close up shop and go home. You’re done.